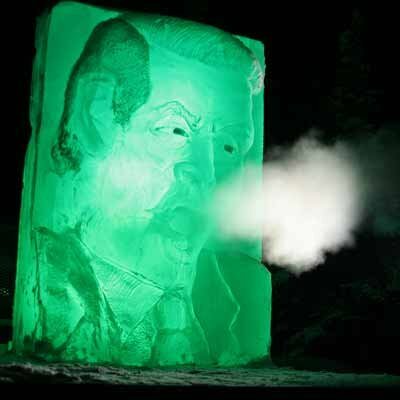 In Fairbanks Alaska there is now an Ice Sculpture of prior vice-president Al Gore. In a tongue and cheek dig at his almost religious like preachings of Global Warming there is now a 2 ton ice sculpture including hot air coming from his mouth. (Compliments of a Ford F-350 truck). Here is a link to the Fairbanks Daily News-Miner article. Also check out the contest at the sculpture owners website. Go and make your guess in the Frozen Gore contest. Guess the number of days that our ’96 Ford F-350 (460ci) would have to run (at idle) to equal the carbon output of a round-trip flight from Tennessee to Copenhagen on a Lear jet. The winner will receive a warm Ski-doo jacket, long underwear, thermal socks and an Al Gore bobblehead doll. A nice excerpt from the article I found particularly interesting. Bolding was done by me to point out reality vs alarmism. Climate change scientists say Alaska has warmed by 3 degrees Fahrenheit during the past 50 years. The average temperature for 2009 was 27.8 degrees in Fairbanks, about one degree warmer than normal, said Rick Thoman, a meteorologist with the National Weather Service. Last winter, however, was unusually cold in Fairbanks. Temperatures in the winter months of 2008-09 were about 4 degrees below normal, according to National Weather Service figures.